Jamie doesn’t want to go back, Elisa has a longing to return, and time is running out for Jamie to decide. The arrival of a giant boy called Setanta and the last shape-shifter of Éire into Elisa and Jamie’s world makes everything more difficult for Jamie. The world of dragons and mythical creatures awaits him, and the elves won’t stop driving him crazy. What is a boy to do? Elisa cannot fulfil her destiny without Jamie, and Jamie couldn’t possibly let Elisa beat him to flying on a dragon’s back. Follow the Spiral of Life or Triskel as it weaves its way through the meadow of Kapheus and be inspired to be all you can be. You will receive a free bookmark of your choice with every two books purchased. You will receive a free greetings card with every three books purchased. PURCHASE THE KAPHEUS SERIES ONLINE NOW! 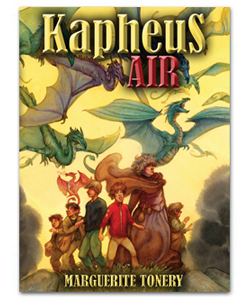 Get your signed copies of the Kapheus Series today!